Please contact boat owner Joan at 315-559-6728. 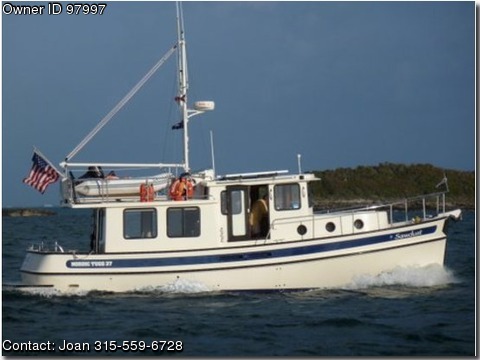 2002 37 Nordic Tug,Sawdust is a well maintained, one owner boat, perfect for long distance cruising and living-aboard. Powered by a Cummins 330. A brief list of equipment includes a Northern Lights generator, bow thruster, auto-pilot, and full electronics. There is also a dual array solar panel system, as well as a recently installed double filter fuel scrubbing system. The galley features a full dual voltage refrigerator along with a propane stove with oven. There is a mast and boom for lowering and raising the dinghy from the roof mounted cradle. Dimensions LOA 39&#39; Beam12&#39;11&quot; Tanks Fuel350 Fresh Water 170 Holding 40. Accommodations: Master in bow, port side bunk-bed cabin.